Dear reader, concrete repair is specialized job and should be performed carefully by professional repair person with supervision and monitoring of knowledgeable engineer. Safety issue is very important in during concrete repair and also before or after repair. We will learn about structural safety in this post. Dear reader we have already discussed about service load reduction in respect of concrete repair. 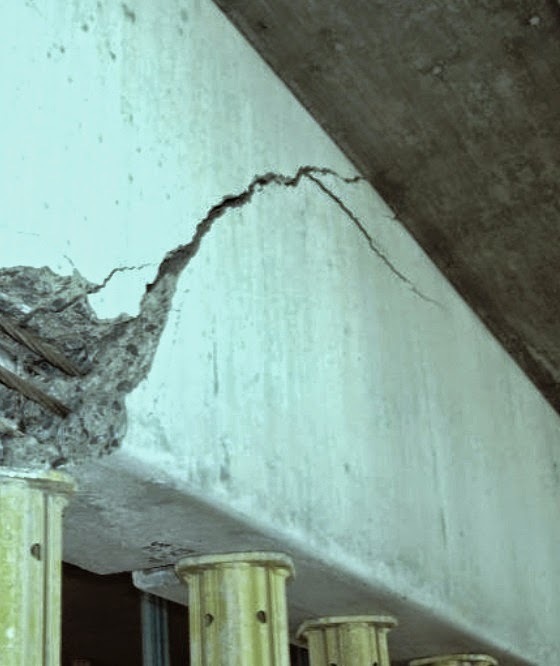 Deterioration of concrete member may involved in concrete deterioration itself and reinforcement embedded in it and with concrete, in many times, reinforcing steel have to be removed from concrete member. Thus when section is reduced, the shear strength along with bending capacity and in applicable cases tensile strength or compressive strength is also reduced. With this section reduction when reinforcement is also removed, the situation often becomes very critical. We know, in concrete members, cast monolithic, have always redistribution of loads/stresses; the repair engineer should have structural insight to understand this and possible support (temporary) like shoring, bracing and in applicable cases strengthening should be considered.